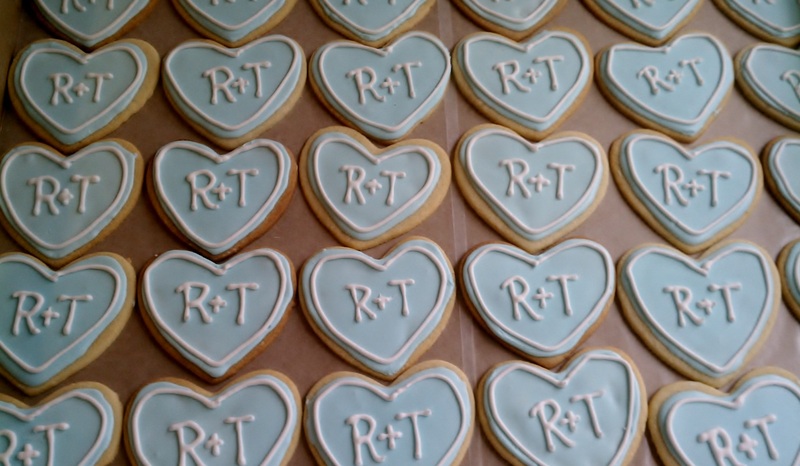 Melanie (blog follower, frequent contributor and test kitchen cook) made more than 100 Rita + Tom sugar cookie hearts for their 40th wedding anniversary. She got conscripted into service to make them as well as 100 German Chocolate cupcakes (but that’s another story). Aren’t they pretty? I’ve been wanting to work with Royal Icing so maybe some pink-tinted hearts for Valentine’s Day would give me that chance. The recipe she uses is well tested. Melanie doesn’t make anything that isn’t superb. Her test kitchen is always heating up! Cream together butter and sugar. Add egg, vanilla and orange peel. Beat together. Add flour and salt. Roll out to a quarter-inch thickness. Cut into shapes; place on ungreased cooking sheet. Yield: Makes about two dozen, two-and-half-inch cookies. “I use Wilton’s Meringue Powder to make Royal Icing instead of raw egg whites to make royal icing. You just add powdered sugar and water, and beat it well. It’s much easier to use than making Royal Icing from raw egg whites, and I’m not a fan of raw eggs being used anyway. “When using Royal Icing, you have to be sure not to let it dry out because it sets up like cement, which is why it’s so good for icing cookies (they won’t get mushed). “To ice Rita and Tom’s hearts, I piped an outline of the blue, filled it in with the blue, and then let that dry. The next day I did the white outline and the writing. I used Wilton paste colors to tint the icing. Video on how to make Royal Icing: Click here for a complete demonstration from the Joy of Baking on how to make the icing. It really makes a cookie very special. A few years before mom died I asked her if she would make me some of her peanut butter fudge. I lived 1,000 miles away so that meant not only making it, but packing and shipping it. At the time, her illness was starting to take its toll and she sounded worn out. But she made the fudge and shipped it to me. That was the last time I had mom’s fudge made by her. But, the recipe and memories live on. I planned to make mom’s peanut butter fudge for Christmas, but time got away from me. I have all the ingredients, so why not make it for Valentine’s Day? I added a little chocolate to top it off for the occasion. 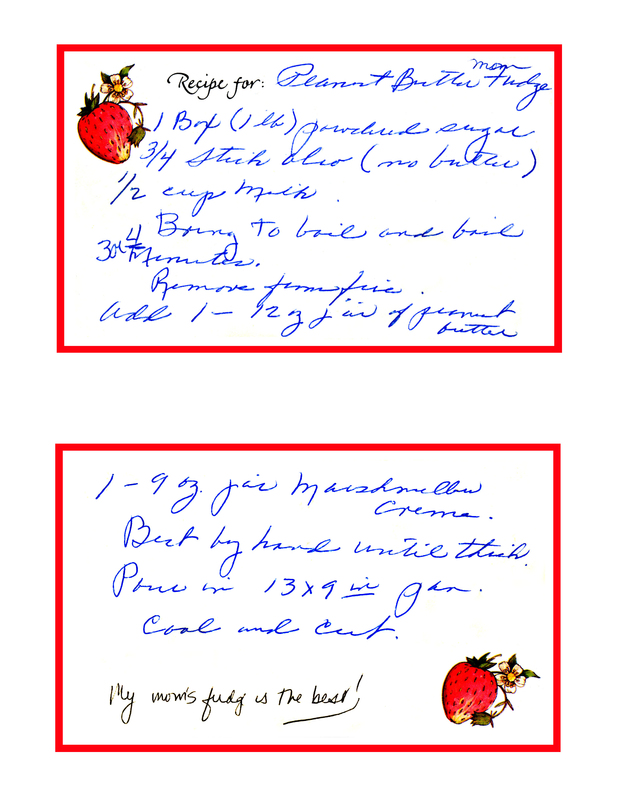 Here’s mom’s recipe in her handwriting. Note that the 9-ounce jars of marshmallow cream or 12-ounce jars of peanut butter don’t exist anymore. Consider the recipe a guideline, not an exact science. You’re going to have to fudge it on the fudge. Mom’s terminology is amusing. When was the last time you heard of oleo? And her instructions to “remove from fire” is classic. Julia Child often said this very phrase. (I know because I’ve read every book written about and by Julia). 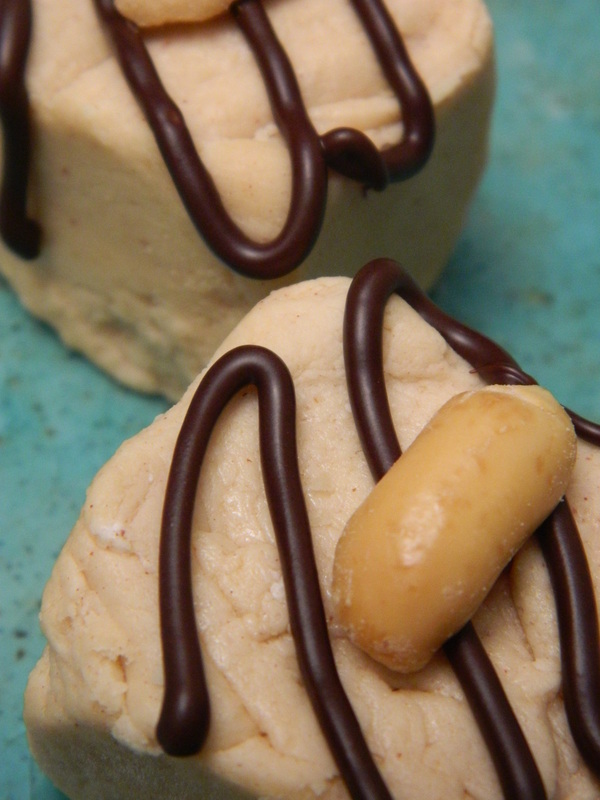 Everyone who tastes mom’s fudge claims it’s the best peanut butter fudge they have ever eaten. It’s not a family secret, so spread the love and make some fudge. Spoiler alert: This might not be totally about a KitchenAid stand mixer. 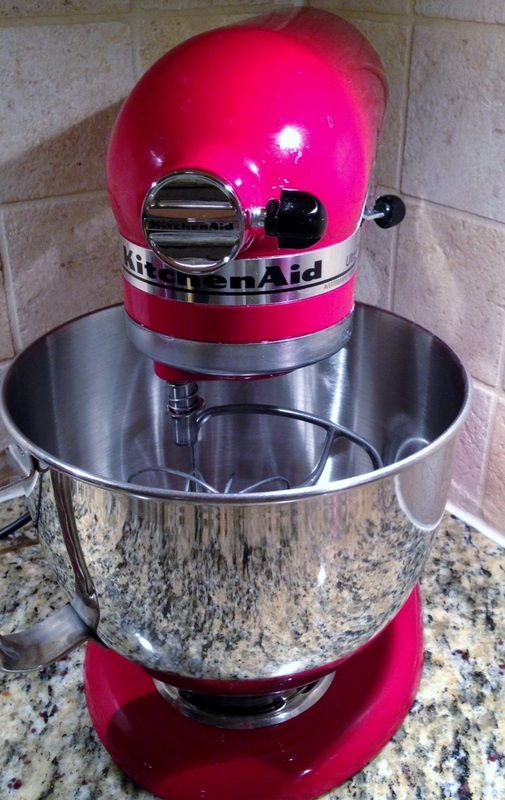 My husband gave me a bright, shiny, candy-apple red KitchenAid stand mixer this past Christmas…again. I said, “I know…but I love my hand mixer. I’ve moved it around with me for 25 years. This stand mixer is so big, so heavy, so expensive, I don’t have space for it…and, and, and…”. Bill said I could take it back, no problem. This past Christmas the same red KitchenAid stand mixer showed up again under the tree. Last week the cookie jar cracked. Prime counter space just came on the market, so I hauled the machine back up from the basement and placed it on the counter. I supposed I would use it someday. 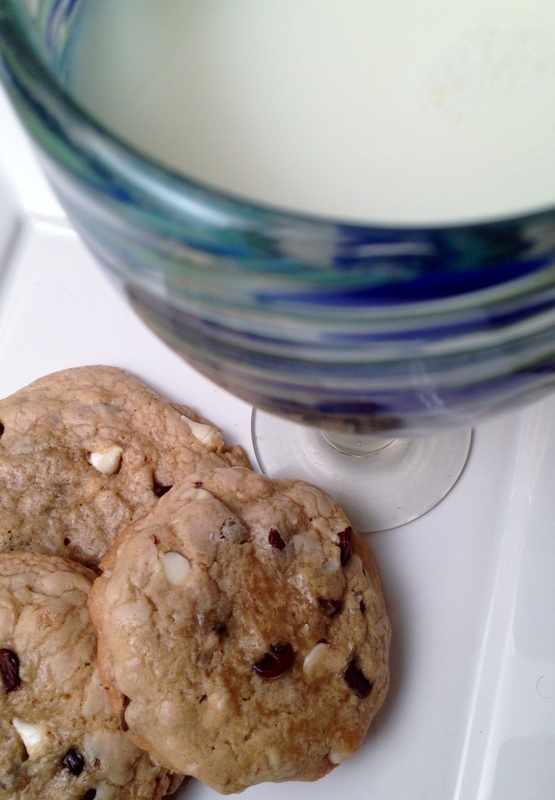 Last Sunday I decided to make a double batch of chocolate chip cookies. Why not try the new mixer? Wow! KitchenAid mixer where have you been all my life!? Why did I resist? My work could have been so much easier and efficient! I felt like a real pro. They nudge, they suggest, they cajole, and sometimes nag, but we refuse to listen and we shut our eyes. Why is it that others who love us know what we need even before we do? I need to remember that, and trust more.